Who Else Wants to Overcome Their Fear of Speaking in Public in less than 21 Days and Become a Fearless Confident Speaker. 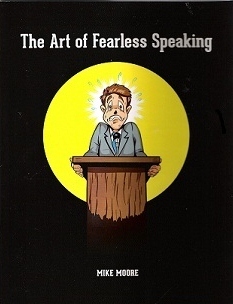 "The Art of Fearless Speaking"
"When You Speak Well You Do Well"
Does the thought of being asked to speak in front of an audience fill you with fear and anxiety verging on all out panic? If so You're not alone. Fear of public speaking is the number one social fear we humans have. But you can relax for help is on its way.... within minutes of reading this letter. Imagine yourself standing in front of an audience of over 100 people sharing a message you believe in. You are really enjoying every minute of this experience. You speak smoothly with enthusiasm and your audience is captivated by your delivery and your presence. At the end of your presentation you receive thunderous applause and people come up to you to say how much they enjoyed it and how you touched their lives. You feel like you are on top of the world. Is this hard for you to imagine? Well, it won't be if you let me show you the secrets to fearless, confident I have employed in my speaking career for over 25 years. A professional looking woman approached me after a talk and said, " I wish I could speak as confidently and as relaxed as you do. I am well educated with a very good job but I just melt speaking in front of other people." " Whenever I stand up to speak in public my tongue becomes all thumbs and can't seem to put two thoughts together. I look and feel like an idiot." You can put a stop to it NOW!! Public speaking is effective communication and being able to communicate effectively has so many benefits for everyone in every aspect of their lives. Here are a few to consider. 1. Public speaking builds confidence. When you experience the thrill of holding an audience in the palm of your hand and receive their appreciative applause your confidence soars. use an increase in self esteem. 3. People start looking at you in a more positive way. Even if you never use your public speaking skills in giving formal presentations, people will notice that you are more articulate and confident in expressing an opinion or sharing an insight. You will discover that they begin looking to you for advice and opinions on many issues. 5. Public speaking begins to alter your self perception. As you begin to use the skills involved in public speaking you will notice that you begin to start talking to yourself in a more positive way. You begin to see yourself as capable and confident. 7. Public speaking gives you the courage to break out of your comfort zone. I believe that the comfort zone is the enemy of human growth. When we are too comfortable where we are we tend to become stagnant. Speaking in public pushes us out of the comfort zone and reveals to us our enormous capabilities. If you feel compelled to improve your public speaking skills but panic at the thought I am here to help you. The benefits and rewards are tremendous. You have so much to gain and nothing to lose. Let me help you become a fearless, confident public speaker in as little as 3 weeks. I am a full time pro speaker with over 25 years in the field. If you follow my instructions seriously you will see a fantastic transformation in as little as 3 weeks. * Standing up at a school or community meeting and expressing yourself clearly, articulately and with enthusiasm. * Imagine yourself speaking smoothly without hesitation in every situation. You Can Do It! I will show you how. I will teach you simple and effective strategies that will take you from being a fearful, panic stricken speaker to a confident, fearless, lean, mean speaking machine.
" 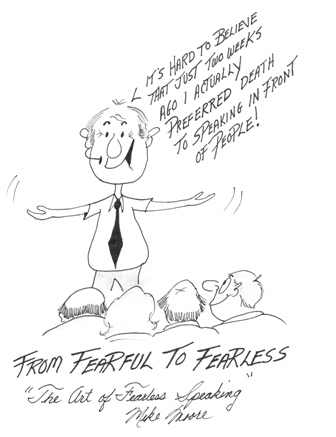 The Art of Fearless Speaking"
The Art of Fearless Speaking is a 40 page Special Report that will come in pdf format for easy downloading and reading. "How to Be Funny and Entertaining"
If you don't find my products helpful I don't want you to have them. There is absolutely no REASON for you to remain shackled by Fear every time you get up to speak. I'm watching people doing presentations right now. I think a lot of them should consider using your help. I was listening to the cd's on the way here they are fantastic ! When is the next time you are doing a open to public speech? I d love to go. **Steve purchased my complete system to improve his business presentations. Break out of your comfort zone and make friends with your discomfort zone and in doing so achieve the heights of excellence in public speaking? I believe that we all have an obligation to make the world a better place and we do that by openly challenging injustice and by sharing our thoughts, ideas and opinions openly with others. BUT in order to do this we must open our mouths and say something. And statistics show that we are afraid to open our mouths in public so we sit and let things that should be changed remain unchallenged. In short...we suffer from pubic speaking anxiety, BIG TIME!! "You are put on this earth to shine brightly but most of us live our lives on dimmer switch." Every-time I speak I get this question from people in the audience," How can you stand up there and speak with such comfort and ease?" I would die a million deaths if I had to do that." I'm not going to insult your intelligence by saying that I can do this in a blink of an eye just by snapping my fingers. I will say that if you are willing to follow my simple instructions and put in the necessary time, effort and determination you will see positive results in as little as one week. You have nothing to lose and a world of confidence and fearless speaking to gain. P.S. Don't be like 95 % of people and say, " That sounds like something I really need." BUT then do nothing about it. The only way to change your life is to take action. So take action NOW . Don't miss this opportunity to get rid of your public speaking fears for good!! Public speaking is a crucial element to an individual’s success and advancement in every aspect of life. Speak For Profit is a public speaking course that is developed and taught by world renowned speaker Mike Moore. This public speaking program was designed to enhance your natural abilities and strengths, making you a more productive member of society. If you are looking to advance your career and life, you have found the correct place. If you need tips on public speaking or presentation skills tips, contact Speak For Profit today. Are you an outgoing person that loves interacting with people and enjoys being the center of attention? Speak For Profit has an advanced public speaking course that provides individuals with the valuable skills needed in becoming master presenters and speakers, both through audio and visual. Whether you are looking to be the go to person to give inspirational speeches at life changing events or the go to person to deliver hard driving sales presentations or proposals, Speak For Profit will give you the tools to become whomever you are looking to be. We have public speaking courses and public speaking books available. Does having to speak in public give you anxiety and hold you back from advancing your career and personal life? With the Public speaking courses and public speaking tips provided by Speak For Profit , your worst fears will become your biggest assets. Our online courses, audio tutorials and personal mentoring from Mike Moore will make you comfortable to speak to groups of any sizes and give presentations like a successful CEO. Thank you for taking the time and visiting our website. Here at Speak For Profit you will learn a valuable skill that cannot only improve any situation but can also create new opportunities. Our courses will give you the skill sets to become a professional public speaker yourself. Imagine a life of meeting and impressing new people in new places while earning a great living. We look forward to hearing from you. Mike Moore is a professional speaker who delivers humorous,entertaining and informative keynote speeches and motivational seminars across Canada and the United States. He also is committed to helping aspiring speakers enter the exciting, profitable world of public speaking.